• Grease 2 15x10 inch log roll pans with cooking spray. Line with parchment paper and spray again. Sprinkle with flour. Mix all he roll ingredients until combined. Pour mixture in the greased pans, spread evenly. Bake 15 min at @ 375 degrees Fahrenheit (190 Celsius). Flip dough on to a tea towel. Peel off the parchment and roll in the towel. Keep rolled for 10-15 min (until cool). Unroll, spread icing and roll again. Cut log in half. Add 1 tsp of special dark cocoa powder to the remaining icing and ice the top of the rolls with remaining icing. • Melt chocolate in microwave - 1 min, then 30 more seconds. Line 4 half sheets with parchment and pour melted chocolate on. Spread with an offset spatula and put in the refrigerator or freezer to set up. 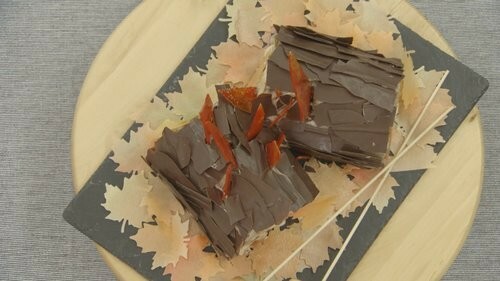 Once set up break the chocolate into shards and place them on the iced log rolls to look like bark. • Put unwrapped candies in a zip-top bag and crush using hammer. Spray a foil lined sheet pan with Pam and put in her oven at 350 degrees Fahrenheit in the oven for 5-6 min. Let it cool. Once cooled break into shards for the fire. • Spray wafer paper with airbrush and cut out leaves of all colors using a paper punch. (I have the punch) Lay these leaves under the log and put one log on top of the other (to look like a camp fire). Stick the shards of yellow and red candy in the logs to look like fire. • Roast a marshmallow on open flame of stove. 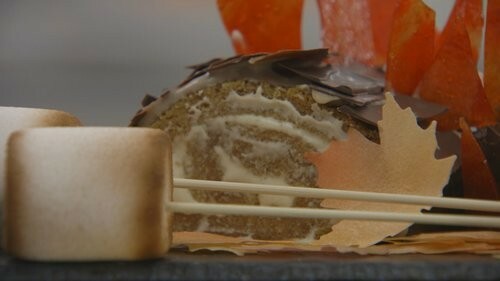 Set a roasted marshmallow over to the side of the cake. • Cream butter, cream cheese and sugar together in mixer. Add in spices, expresso powder, and paste. Last add powdered sugar and whip until fluffy.